I made this card to play along with Mojo Monday #196 this week and to play along with the Heart2Heart Challenge Blog! 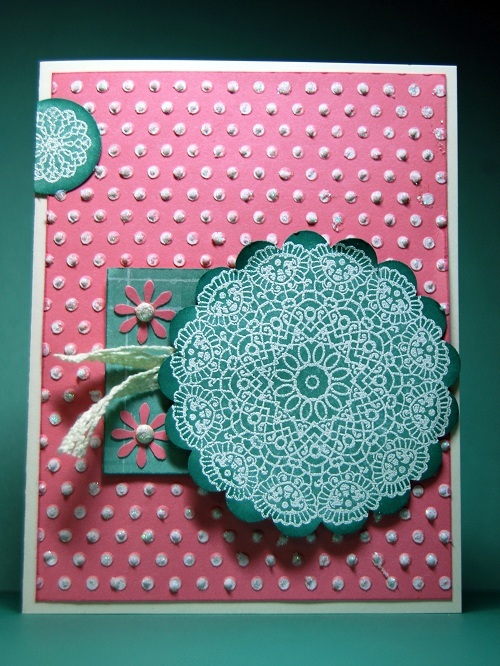 This week's challenge was a Bingo challenge and the row I chose was doily, flower, lace. This week was kind of crazy with the kids being off from school and my oldest coming down with a double ear infection so I'm just coming in under the wire on these two challenges - eek! 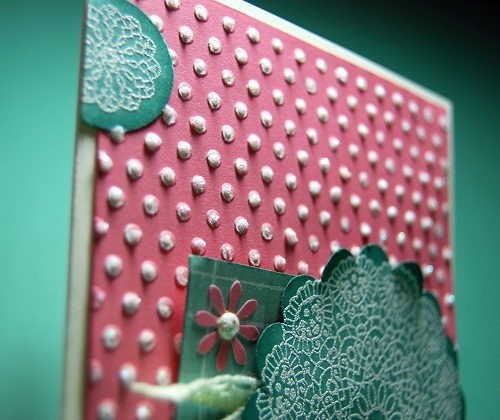 Its kind of hard to see on the first photo but after this card was all finished I put a little dollop of Glitz Glitter Gel on each of the embossed and sanded polka dots to give them some bling and extra dimension. 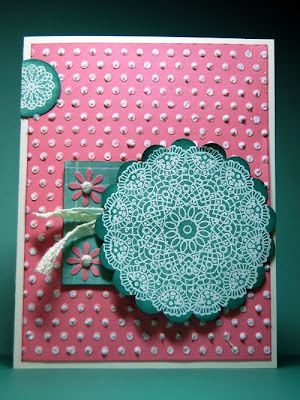 This beauty did just make it in under the wire:) Isn't that doily stamp divine? I can't believe you painted all those dots, what a fab background! Thanks so much for playing H2H bingo with us! I love the colors on this card! You did both challenges justice - lovely work! Pretty. Thanks for joining us at H2H! Your card is beautiful! You have way more patience than I do! LOL Thanks so much for playing H2H bingo.